Marisela (Ofelia Machuca) detained by two officers ( Powell Gaynor and Tai Tran) for driving a car with a broken tail light, Dec. 7 at the San Jose City College theater. 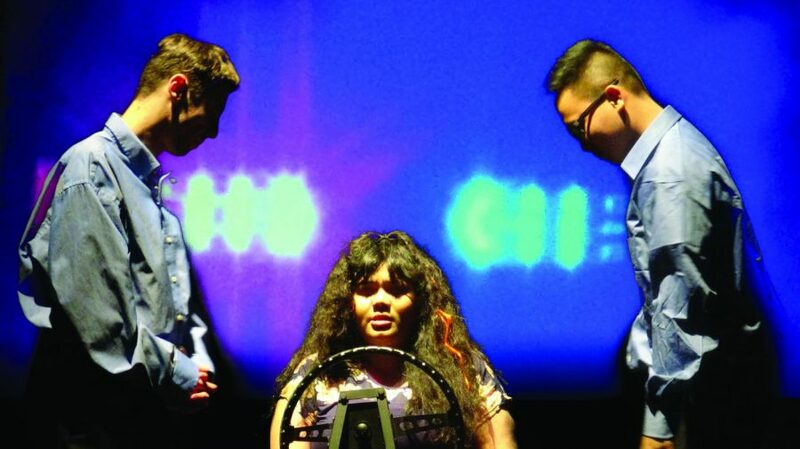 San Jose City College students who en- rolled in the drama class put blood, sweat and tears into “Just Like Us.” The play was held in the drama/theater arts department from Dec. 6 through Dec. 9. There were about 19 character roles in the “Just Like Us” stage play, and the cast rocked its performances so well! The story is set in Denver, Colorado, and there is loud yelling, screaming, fighting, flashes of anger, trials, discrimination, even a baby boy… but there was also family, love and support at the end. The audience witnessed a heartbreaking family split up at a train station and the story of a reckless driver, an illegal alien who killed a 6-year-old boy, knocking him from his motorcycle in Thornton, Colorado. The audience witnessed the news that an immigrant killed a police officer; there was an arrest, protests, death. Action takes the form of getting pulled over by police, sentences, criminal records, jail, a judge and courthouse. At the heart of it all, is the four girls and their bad times. They were seen as students, in college and high school. The audience lived through their graduations, romances, marriages, music, dancing, par- ties, club scenes, movements. The play goes through a full range of emotions. drama/theater room became almost full. They witnessed pain, prejudice, drama, both good and bad times. The students’ performance was stunning, and people enjoyed the show because it felt real. They would clap and cheer after each play scene, with some people taking photos and videos of students onstage despite the no photography/videography rules. Students who participated in the production attribute their motivation to be part of the drama department to their passion for acting and the inspiration they receive from their friends and family. 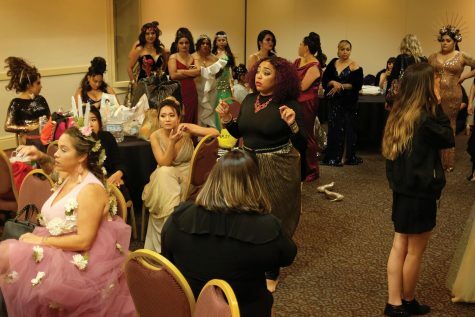 Fadia Zeid, 32, who played the role of “Charro, Ensemble” said she was grateful for the import- ant people in her life who sup- port and motivated her, which is what made her decide to take acting class to perform in the play. At San Jose City College, there are three classes available for acting: Theater Rehearsal/ Perform, Beginning Acting and Intermediate Acting, which is instructed by director Anita Reyes. Some students that participated in the production are working on transfer credits to transfer to a university which takes time and dedication while rehearsing. • Principle, Ensemble – Cat Portales.